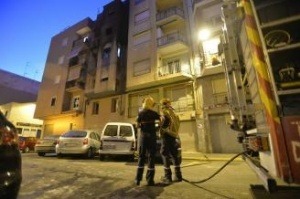 A fire in a house in Elche leaves six families evicted and one policeman injured. Despite the scale and magnitude of the event, no serious personal injury was to be regreted. There was only one attended by anxiety and inhalation of smoke, the most common death in fires. The fire began in the hall of a second floor, which was empty, and spread to the upstairs floors. The house was empty at the moment of the fire so it was the neighbors who, alerted by the smoke and the flames, gave the warning to the Fire Park of Elche. The flames swept through the windows of the house and reached the upper floor, which was also affected by the fire, as well as one of the houses of the adjoining building whose windows were calcined. Neighbors were attentive and called to the Fire Park at time. We don’t have to regret any deathor personal damage, but material loss could have been avoided with a correct installation of fire prevention system installation.